If you thought homework was bad… Try punishment homework! As I type, I am sitting next to my 6-year-old who has to re-write his school’s promise because he’s been talking too much in class. It’s quite long, he doesn’t write well, and he’s already been “working” on it for 12 minutes. Every time he complains, I say, “Next time, when your teacher has asked you to stop talking, remember how you feel right now, and keep your mouth shut,” (you’re welcome, Ms. Nelson). Watching this process has me thinking though. Right now, Gavin is angry at ME for making him do this. Despite the fact that this is the result of his own actions, he is blaming ME for being the bad guy making him do this. He’s six, I don’t expect him to 100% get that this is his own doing, but I am frustrated because I am handling another’s issue. I am the one sitting here having to deal with an issue that’s happening in another teacher’s classroom. I am giving up family time, dealing with a very angry child, and it’s not even my choosing. I realize things are probably different in the elementary classroom, but in secondary, we are encouraged to handle student issues ourselves. Why? Because when you have someone step in to “help” you often undermine your own authority. To clarify, I am not talking extreme circumstances which REQUIRE the assistance of an administrator–I’ve already had one of those this year when a kid was playing with a lighter in class. As a whole, an issue such as “too much talking” should be handled with the teacher, perhaps also by calling home and/or setting up a detention. I would NEVER send a student home with a punishment assignment. I don’t even think we are allowed to do that at my school. We cannot assign extra work for an individual unless it’s going to be graded and cannot grade a behavior. If it’s a classroom management issue (which this obviously is), it should be handled in the classroom, NOT AT HOME! I feel so bad for his teacher. I have 7.5 years of experience, have made many mistakes, learned a lot of valuable lessons and have attended a plethora of amazing professional development seminars that are research-supported. Not to mention the fact that I have done my own research–here’s a great article on consequences at school, note it does not say anything about sending the consequence home. Plus, I’m extremely passionate about student-centered learning and classroom management. Because of all of this, it is taking all of my willpower to not become that parent. That parent who puts in her 2 cents on every little thing that happens. While I am not happy with her choices, I also 100% recognize that she is doing what she thinks is best, and quite possibly is learning along her own teacher journey–my experience makes me sympathize and makes me unable to become that parent. She said this is her second year at Gavin’s school (perhaps it is her second year ever). My second year of teaching was my worst. I learned so much by doing all the wrong things that year. As you can see, Gavin did not finish copying the Promise. After spending over an hour on the assignment, I allowed him to stop. We discussed the importance of being quiet when asked not to talk and the importance of listening at school. Feel free to have him finish the assignment with you if you feel it is necessary. I told Gavin he may need to finish it with you at school. Perhaps it would be beneficial for him to associate the consequence with school. In the future, please let me know if you have any issues with Gavin’s behavior, and he will lose privileges at home. As a fellow teacher, I can understand your frustrations. Gavin needs to be quiet and listen in order to learn and so that he does not negatively impact other students’ learning. Please contact me with any further concerns. I wanted to call her out on the inappropriateness of this assignment and wanted to say, “do not send anything else like this home.” Hopefully, she will get the memo from my more subtle delivery. If not, and another assignment like this comes home, I will be more explicit. I also want to note, that despite my obvious opposition to this task, I made it clear to Gavin that I support his teacher giving him a consequence for his actions. There’s nothing like having a parent undermine a teacher’s authority. While I may state my opinion here to colleagues and other adults, I would NEVER say this in front of Gavin. That would be more inappropriate than the assignment itself. Nevertheless, from one teacher to another: handle your classroom management issues in your classroom. I hardly ever give homework–besides studying/looking over notes/activities we completed in class. I am very aware that my students have 6 other classes that require a lot of homework. We have the agreement that if they use my time wisely, I won’t take any of their time outside of class. Sure, high schoolers need to be challenged and prepare for college, but they still need to play. What’s the rush to make them grow up and take away all of their free time? Let’s allow them time to explore, relax, read for fun, take a brain break. I know that homework can be extremely valuable for learning if it’s meaningful. I recognize that practice is necessary for success. I merely choose to maximize practice time in the classroom so the students aren’t overburdened outside of school. 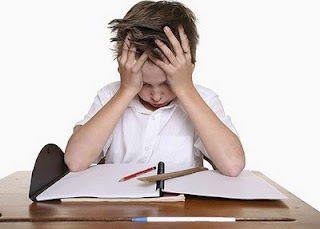 In the LOTE classroom, it is possible to avoid homework most of the time. We pick up where we left off the next day. I can guarantee that most of my students will complete most activities because I am there to make sure they do. My students don’t get zeroes unless they actually try and earn one (which sadly that happens occasionally when someone is a little lost). If a student doesn’t do an assignment during class, they get the warning, and then if they still don’t do it, they get a detention. Guess what we do during detention… You got it, that assignment. Late work is a non-issue. So where is this post coming from? Well, if you are my Facebook friend, you know the answer. I have a first grader who has had homework every night this week. On Monday, we were instructed to explore his new planner together. We spent 30 minutes on this task during which Gavin complained that he’d rather be watching TV. Tonight, we had a scavenger hunt through the planner to find things. I actually think the scavenger hunt is a really cute idea… FOR OLDER KIDS. Gavin could not read the majority of the activity and is not a fast enough reader to sift through the planner to find information such as how to set up a lunch account. Let’s be honest. This activity was NOT for the kids. It was to get the parents to look at the planner and find “important” information. I tried to get Gavin to write the answers, and he got frustrated. He couldn’t spell well enough to do most of it, so I did it. I mean, this activity was not student-focused at all; it was parent-focused. This true life example validated my decision to limit homework. Some homework is just busy work. If it’s not meaningful, if it’s not going to help him improve in an area, don’t waste our time. My husband is deployed, making me a single-mom of two kids for the year. We don’t get home until 6 (or 7:45 on Tuesdays after dance and martial arts). If we have to tack on some homework after we manage to finally eat dinner, please ensure it’s worth our time.